Zombie films are great, but one thing about them always irritates the scientific mind. It’s never really clear what the cause of the zombie outbreak actually was. A chemical spill, dust from a comet, okay, but why are the living completely unaffected? What is the mechanism of the mysterious substance that animates corpses, and why do they show such terrible communication skills and dreadful personal hygiene? 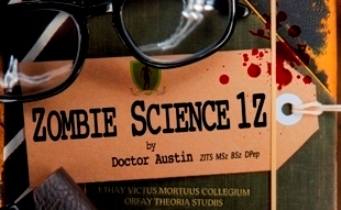 Doctor Austin sets out a scientific basis for zombification in this book. Real-life comparable diseases are examined and their causes and spread considered from a scientific viewpoint. There’s real science in here, with genuine references at the end, but don’t be scared. It’s not some dry and dusty textbook. Doctor Austin manages to inject humour into this most serious of subjects. The book is designed along the lines of a University course and so is set out in a logical manner with each section building on previous sections. It is not, however, at all difficult to follow. You do not need a good diploma in zombiology to begin, you can start with no zombie knowledge at all. By the end of the book, you’ll have plenty. There are three modules, or sections. In the first, you’ll learn about the zombie condition and how it is defined. Next you’ll learn about a whole range of potential causes of zombies, and finally - and this is something never explored in any zombie film I’ve ever seen - possible treatments and cures. You can read this book purely for entertainment, and you’ll be entertained. There are a few typos in the text but really, only a pedant like myself would spot them all. A quick pass by a copy-editor would soon sort that out for the next edition. If you find reading tiresome or difficult, you could instead choose to attend one of Dr. Austin’s live lectures on the subject. I hear he will be in the vicinity of my local swamp in the near future and hope to see him in action. If you’re writing about zombies, this book is more than just entertainment. It will give you ideas for genuinely scientific and credible backgrounds to your own zombie outbreaks and most of all, it will give you ideas for something no zombie story has ever, to my knowledge, even considered: recovery from the zombie condition. Finally, when you’ve read and absorbed the information, there is an online exam. A nice, interactive touch, rarely seen but which gives the book an air of authority and lets you, the reader, feel really engaged with the subject. If you’re interested in zombies, read it for fun. If you’re concerned about the coming zombie apocalypse, read it for survival. If you write horror, add it to your reference library. In fact, unless you’re a complete zombophobe or utterly devoid of any level of dark humour, I can’t think of any reason not to read this book. You can buy Zombie Science 1Z HERE. 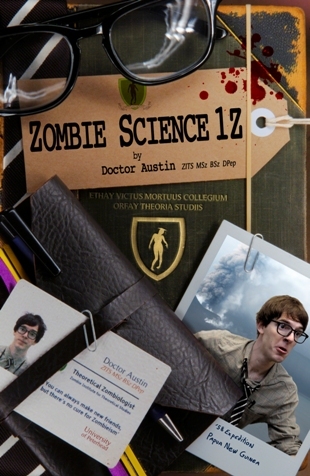 Doctor Austin ZITS BSz MSz DPep is Scotland’s leading expert in Zombieism and Head of the Zombie Institute for Theoretical Studies (ZITS) based at the University of Glasgow. He holds a Masters in Zombiology, a Bachelors of Zombotany, and a Doctorate of Pepper. 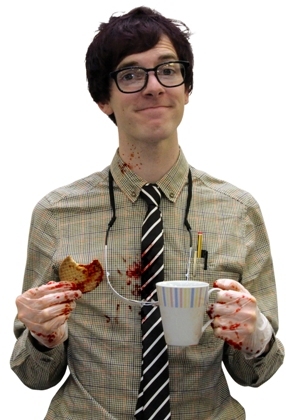 Doctor Austin is also Zombiologist Royal to Her Majesty the Queen of England.